The bones of the neck (vertebrae) are the smallest of the spine, offering the least stability and support. The muscles of the neck are long and thin, and do not have the bulk found in other areas of the spine making them proportionately weaker than they need to be to hold the head up. The weight of the head (10-12 pounds) sitting at the top of spine presents a mechanical disadvantage. With this heavy weight at the top of the thin neck, it takes a lot of effort to hold the head up during the course of the day and nearly impossible during a violent impact. The neck is a structure designed to offer flexibility that allows the head to turn rapidly through a large range of motion. But this flexibility adds to the vulnerability of the neck to injury and the ease of misalignment during trauma. A small amount of spinal misalignment can cause a pinched nerve in the neck that can cause pain, numbness, tingling and other health problems. This is why the neck can be strained while simply staying in an awkward posture for a prolonged time. A neck strain or pulled muscle in neck tissue by definition is usually not a serious injury, even though it can cause a great amount of neck pain. Most commonly pulled muscle in neck tissue starts when a person turns or stretches the neck and head too far or too suddenly. Neck pain can be mild to severe, constant or only during activity, and linger for days or weeks if no treatment is given. Often a stiff neck with limited range of movement becomes part of the body’s defense mechanism. This kind of injury and the resultant neck pain it causes is usually self-limiting and tends to recover well in a week or two if no additional neck injury occurs while it is healing. If rest and reasonable treatment measures are used to speed healing a pulled neck muscle can heal in a few days. However, if not treated promptly the pain and limited movement can become great and can lead to easy recurrence. Major blood supply to the brain. In the end, the need to protect the blood vessels, respiratory passages and nerves has been balanced with the need for mobility and flexibility, making the neck rather vulnerable to the stresses and strains of everyday life – to say nothing of direct injury. The largest section of the spinal cord and the base of the brain are held within the neck. 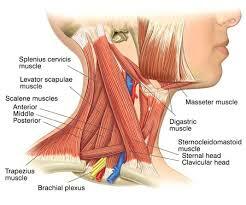 Those nerves that will eventually reach your toes, and every other part of your body, must pass through the neck. People are executed by being hung by the neck because everything important to life passes through it. In spite of the need to protect the blood supply to the brain, our ability to breathe, the spinal cord and all those important nerves, the neck must also be flexible. 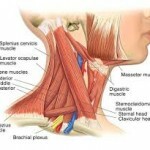 Our field of vision is dependent on the flexibility of the neck. To look up, down, right and left in almost a complete hemisphere of vision. This easy and extended movement of the neck almost encourages the head to twist farther than it should during an accident, and often allows the muscles that are attached to the shoulders, neck and skull to stretch and tear. The same design that permits the neck to be so flexible, while protecting the spinal cord and most major nerves of the body, also makes it vulnerable to easy injury. Holding a telephone between the shoulder and ear. Looking down to talk to a child. Looking up to talk to someone who is standing nearby. Sleeping on a pillow that is too high. Sleeping on a couch with the head on the armrest. Straining and hunching forward while reading small print on a computer monitor. Lumping and slouching while sitting in an overstuffed chair. Posture and position at work (cashier who turns to one side to run register or handle purchases). Wearing a hard hat at work. Frequently walking down stairs rapidly (small minor jolts to the neck). Riding in any vehicle that vibrates and jars the body (small minor jolts to the neck). Doing any heavy work while fatigued and the body is not functioning at peak performance. What is important about knowing and understanding common signs and symptoms of a simple neck strain, is knowing when other signs indicate that the problem might be more serious. What might first appear to be a neck strain might actually be an early indicator that a larger and more serious problem is going on. Pain – By far the most common symptom of a neck strain is pain; sometimes pain is the only or first indictor of a simple strain of the neck. The pain might begin immediately after or an injury or a few hours later. Seldom does neck pain begin days after a common level of neck injury. Stiffness – Inability to move the neck in a full normal range of motion is not uncommon after a neck strain. Limited neck movement is common as the body’s way to protect itself from further injury. The greater the limited movement, the greater the level of injury. Point tenderness – Isolation of pain to one isolated and limited point or area of the neck when touched or pressed upon is usually do to muscle spasms at the site of injury, so this is a common finding. Sometime the neck will only hurt when being touched; no neck pain is felt if it is left alone. The lighter the touch that causes pain, and the larger the area of tenderness, the greater the level of injury. Areas of contracted muscle – Tight knots or masses of contracted tissue are the result of protective spasm in the neck where injury has occurred. The more areas of contracted tissue, and the more sensitive they are, the greater the level of injury. Inability to perform usual and customary daily activities – Pain and aggravation of other symptoms while doing common daily activities (bathing, dressing, eating) is common when a neck strain is present because this stresses the neck muscles that are used in small ways during all these activities. Radiation of pain into the lower back – Can occur when the pulled neck muscle problem is extensive and more severe. Sometimes neck pain or a stiff neck is just the start or the first sign of a larger problem. Clicks and snapping sounds during neck movement. Weakness of the neck or arms. Contact your primary care doctor or chiropractor if you experience any of these last listed signs and symptoms. Apply ice or cold packs to the area of greatest pain. This is the first and primary step to take because cold helps reduce inflammation in the injured tissue and jump-starts the healing process like nothing else can. Apply ice or cold to the area of greatest discomfort for no more than 20 minutes at a time, followed by at least 40 minutes with no ice or cold applied to the area to allow it to warm up again and restore a normal blood flow. Apply no more than 5-6 times a day. Rest. Do not use the neck more than necessary. Certainly, do not move the neck in such a way or to such a degree that creates a lot of neck pain. Allow the pain to tell you how far you should limit neck movement. Support the neck. Roll a small towel into a tight column, and hold together with a few rubber bands. Without a pillow, lie face up on a mattress. Place the rolled up towel under the nape of the neck to support the neck into a normal slight arched curve. The towel placed in this way should feel good and should help relax the tense feeling in the neck. If it causes any discomfort stop using it. Modify how you are using the rolled up towel until it feels good when in place. Immobilize the neck. If movement is especially painful, wearing a soft cervical collar for a day or two to prevent unguarded movement will reduce pain and speed healing. Do not continue to immobilize the neck once severe pain is no longer a problem. Wearing a neck collar too long will only weaken the neck and make additional injury more likely to occur. Apply moist heat. The heat from a moist source will penetrate deeper than heat from a dry source. Make a moist heat source by wrapping a moist towel around a moisture-proof electric heating pad or a hot water bottle. Always use a low temperature setting to avoid tissue burns. Heat dilates blood vessels to bring in additional nutrient-rich blood into the area of injury, It also encourages removal of inflammation by-products and stagnant blood. Both of these effects stimulate healing. Drink plenty of water. After an injury to any soft tissue in the body toxins are released that will cause soreness, pain and stiffness. Drink more water than usual to flush toxins from the injured tissue. Begin moving and using the neck as soon as slight relief is felt. Staying inactive not only weakens muscle tissue rapidly, it delays recovery. Start doing gentle neck stretches. Small careful activity that does not cause great discomfort is beneficial. You must move to recover rapidly, but you must also be careful that you do not overdue that activity. Easy does it. Over-the-counter drugs. Anti-inflammatory medicines such as aspirin, or ibuprofen (Advil) or naproxen (e.g. Aleve), reduce pain and inflammation. Massage. Gentle massage that does not aggravate pain is safe. Even fingertip stroking of the area of the pain toward the heart will stimulate blood flow into and out of the injured area, encouraging healing. Traction. Ask someone you trust to very gently stretch your neck. Make sure that this person will agree to do what you ask of them, and not do anything more or differently than what you want to be done. While lying face up on the floor or a mattress, have your helper stand over you and hold your head in two hands. Grasping the head the helper will only apply that much traction as feels good to you; traction that will relieve your neck pain. No more force than this should be used. If possible ask your helper to hold the traction for only 2-3 minutes, and no more. Do not allow the helper to release the traction for suddenly; traction force should be released slowly to allow the body to accommodate to the return to the feeling of compression. Do not use any force greater than what is needed to relieve pain, and do not hold any traction force longer than 3 minutes. Acupressure. 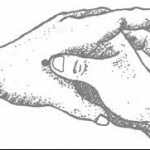 Use the tip of the thumb to apply a circular rubbing massage to the web of the thumb of the opposite hand. 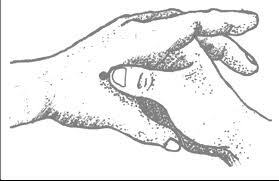 Use the tip of the left thumb to apply a gently circular rubbing massage to the web of the right thumb for five minutes or so. Once finished, do the same circular rubbing massage to the opposite thumb web with the opposite hand. The web of the thumb is the meaty area of the hand at the base of the angle between the thumb and index finger. Talk to your doctor. If you have any doubts or concerns about your recovery or what care you are using, do not hesitate to call your doctor for advice. A minor soft tissue injury of muscles, tendons and ligaments in the neck or anywhere in the body should heal within just a few days, or at least begin to show signs of good improvement within that time. If within 5-7 days you do not notice a considerable amount of pain reduction, or if in the first 3-5 days you notice an aggravation of pain or appearance of new symptoms you cannot explain, call your primary care doctor or chiropractor for evaluation, diagnosis and treatment. Being examined by a doctor is essential for all neck strains or complaints that arise from a significant mechanism of injury. This is also true for severe, persistent, or especially for unexplained symptoms or problems. As with other skeletal complaints and injury that might be considered mild to moderate, supportive self-treatment that guides prompt reduction of pain and other symptoms is usually enough for complete recovery without the need for medical intervention.